After taking a few years off of biking, I'm trying to step back into things. A few years ago I put my 80's raleigh road bike on the shelf after putting thousands of miles on the thing, and rebuilt a Centurion Ironman. The problem is, the bike is not made for weekend riding. The cogs if I remember right are 12-21, and in GA this doesnt work. Hills become an incredible challenge. Last edited by lnlogauge; 06-19-07 at 06:28 PM. 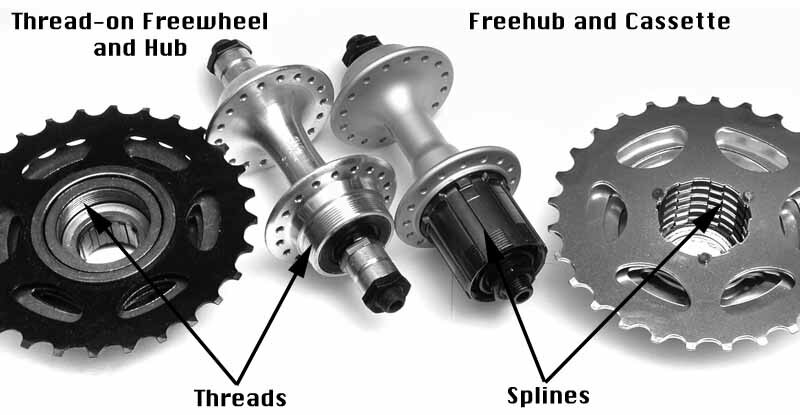 Sure it's a freehub/cassette and not a freewheel? Thanks for the links, I just need more detailed information as to what I need to buy and how to do it. I am sure its a cassette and not a freewheel. I did a Uniglide to HyperGlide freehub conversion on a 7sp UG Shimano 105 hub a couple of years ago. I bought an entire NOS rear hub on eBay for about $15, 7sp HG-20 I think, and swapped the freehub, cones, spacers, and locknuts. You can also get Uniglide cassettes and loose cogs at http://www.loosescrews.com/index.cgi...d=361069111556 Selection is not great but I've picked up a few (I still run Uniglide on my old 6sp MTB). Last edited by Gonzo Bob; 06-19-07 at 12:39 PM. Riding with 7 of 8 cogs and some old DA 8 speed STI shifters on a Dura Ace 6 speed uniglide hub. This setup uses the original 12t or 13t cog to hold everything together. Cheap fix, spend $10 for a low end cassette (maybe a 7 speed), which you can take apart for the gears you want (24t 28t 30t). File down the one wide flange inside each cog and slide the gear onto your hub. Use your old spacers. Old 80's Shimano road rear derailleurs will work with a 32t rear 42/52-53 front, or 30t rear with 38-39/52-53 front chainrings. You will probably need a new chain to wrap over the large-large combination. A 32t bailout and a 42t crank will have you spinning up the hills again. +1 did this, too. You need cone wrenches and a 10mm allen wrench. Last edited by vpiuva; 06-19-07 at 01:20 PM. thanks very much for that link. So basically Im just reusing my existing wheel and spokes, but replacing everything else? or does the hub in the link come apart so I can just transplant what I need? SO your saying buy a hyperglide cassette, grab the 24t, 28t and 30t, file down what you listed and assemble back up? If thats the case, can my derailer which now goes to 21t handle a 30t with a longer chain? You don't really need anything than a couple of lower gears. May not even need a full 30t in the rear depending upon your hills. A good 1st step is to replace your small-chainring with a 38t one (most likely it's a 42t right now). Then replace your three or four largest cogs on the cassette by filing down the wider flange so it fits onto a Uniglide freehub body. You may end up with something like this: 12-13-14-16-18-21-24t which will work for the majority of hills with a 38t front chainring. Or you can go to: 12-13-15-17-20-23-26t which I've found works well up to 12-14% grades. Of course, it depends upon your fitness and how fast you're climbing. Take apart a cassette with individual cogs. A newer cassette will have shift ramps too. Reduce the width of the wide spline on each new cog that you want to try (file it). I would add a 24t and something larger, 28, 30, or 32t for the hills I ride. Take off a couple of your smaller teeth. Use an online gear-inch calculator if you like to get an idea of the ratios and jumps you will have between gears. My Dura Ace 8 speed rear and 105 rear derailleurs both work fine with up to a 32 tooth rear cog. Getting the correct chain length is critical. You do not want a too-short chain which will lock up trying to shift to the big-big gear combination, or a too long chain which will hang slack on the small-small combo. So you wrap your new chain through the derailleur and around the big-big combo, with as much chain as you can use without going slack on the small-small combo. Keep your uniglide 12t to hold the cogs onto the cassette. Replace some of your other gears. I find 13-15-17-19-21-24-30 (with 39 front) or even a 32t (with 42t front) works fine on my 1980's standard road cage shimano derailleurs. Anybody seen downtube clamp for bike with now braze-ons?